The 6 inch pulley was many Meccano boys' dream part. Even now, one's first purchase of a part 19c tends to signify the jump from 'junior' to 'senior' Meccano, for some reason. Or is that just my opinion? 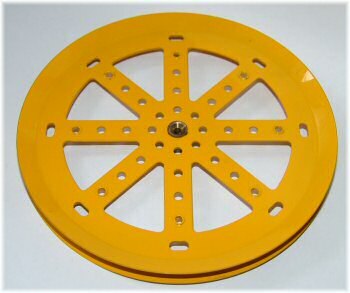 It's not immediately obvious that the 6'' pulley is actually made from the same initial stamping as the 118 hub disc, introduced at the same time. It seems more likely that this part was made simply because it presented itself as a possibility, rather than there being any real need for a pulley of this size. The groove is massively oversized, and there was never a tyre designed to fit it. The two identical sides of the 6'' pulley are riveted together with small brass eyelets. Some versions have this eyelet painted, some don't. This indicates whether the separate sides were painted before or after assembly. It is quite easy to remove these eyelets, along with the boss, and create two 'half-pulleys'. These parts allow you to make excellent 6'' overall diameter locomotive wheels, when bolted to a 5½'' circular girder or part 118 hub disc. The purists would frown on you though! In fact, in the 1978/79 spart parts list the 19c is shown exactly like this; as two separate parts with a bush wheel included to bolt the pair together and form the boss. None of these have ever been found, though, and the only known dark blue examples are the same design as the previous versions. Although the 6 inch pulley was introduced in 1924, it remains rare in nickel plate. At 2/6, it was the second most expensive part in the Meccano system after the shuttle. Since it was not included in any outfit, even outfit 7, it rarely featured in any models or supermodel leaflets. It was available in black paint (date uncertain), this and the dark red version are somewhat more common, but it was not until the part was added to the contents of the 10-outfit in 1950 that it became a common feature of larger models. Note that the 6" pulley was available as a spare part right up to 1941, and would have been in medium red for those last few years. Medium red and light red versions are of course the most common. It appears that the 6'' pulley changed from light red directly to blue in 1964, and was strangely supplied in this colour scheme in the limited number of Silver/Black/Yellow outfit 10's of the late 60's. Blue is therefore fairly common, but the 1978-on dark blue is quite rare, as (apart from in the 10-outfits of the time) it was not listed as a spare part, even though it was available. The only design change came in the late 60's, when the elongated holes at the end of each spoke were slightly enlarged. You have to look very carefully to spot it! The hub disc part 118 changed at the same time, confirming that the source of these parts was still the same. Richard has sent us this picture of a pristine yellow 19c. But it's not one of the standard yellows we're used to. He describes it as "slightly lemony". It's come out of the model room in Binns Road for some special project, but I don't understand why it's this colour. 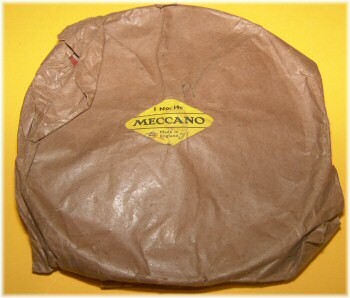 It is thought that the 19c was never supplied boxed, only wrapped in paper (as per this example). The lack of a product code number on the label dates this part prior to around 1954. Of course, the 19c was only supplied in 10-outfits, and thus it is very unlikely that it was available post-war as a spare part until at least the reintroduction of the 10 outfit in the middle of 1950. ¹ The pulley changed from red directly to blue in 1964, and was supplied as such in all known silver/yellow/black outfits. 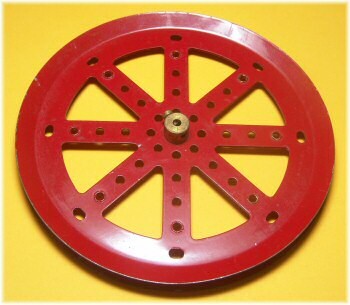 We have yet to come across a post-war black 6'' pulley (stamped Meccano Made in England). If you find one, please send us a photo!